This recipe was created by a young gentleman who suffered ulcerative colitis from age 17 until he found his cure in the Specific Carbohydrate Diet, which allows vegetables and some spices while outlawing grains, lactose, and sucrose. If your IBS is triggered by lactose, sucrose, or grains, vegetables may not be such a problem for you, and this salsa may help you find health, not hurt. 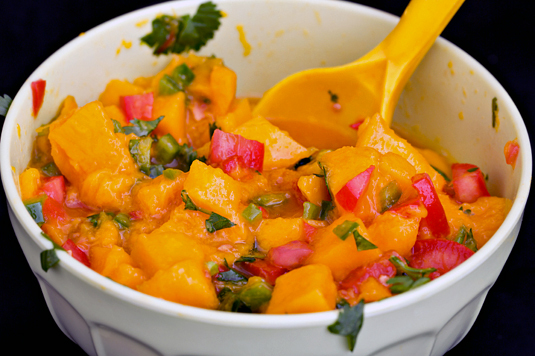 Mix the mango pieces with the chopped chili, green onions, red and yellow bell peppers, cilantro, and lime juice in a bowl to serve as a dip or as an accompaniment to guacamole. Per serving: Calories 59; Fat 0.3 g (Saturated 0.05 g); Cholesterol 0 mg; Sodium 4 mg; Carbohydrate 14.9 g (Fiber 1.9 g); Protein 0.9 g; Sugar 11.3 g.